A step towards revolutionary changes in this Court to minimize the problems being faced by the learned members of the Bar, litigants public and the members of the Establishment of this Court it has been decided to curtail the back-log of files lying in record rooms and different branches and to manage space for the newly instituted cases. For the purpose, the Information Technology is being utilized for rotation of files according to their priority. To achieve the above task, latest Computer Technology is being deployed in different branches/offices. Moreover, just to avoid possibility of lack of communication qua fixation of cases, the learned members of the Bar are being apprised about fixation of their cases through SMS & Email. On 13-11-1997 Hon’ble Chief Justice ® Mr. Justice Rashid Aziz Khan was pleased to inaugurate the webpage of this august Court in the Judges common Room. All the Hon’ble Judges were also pleased to grace the occasion. 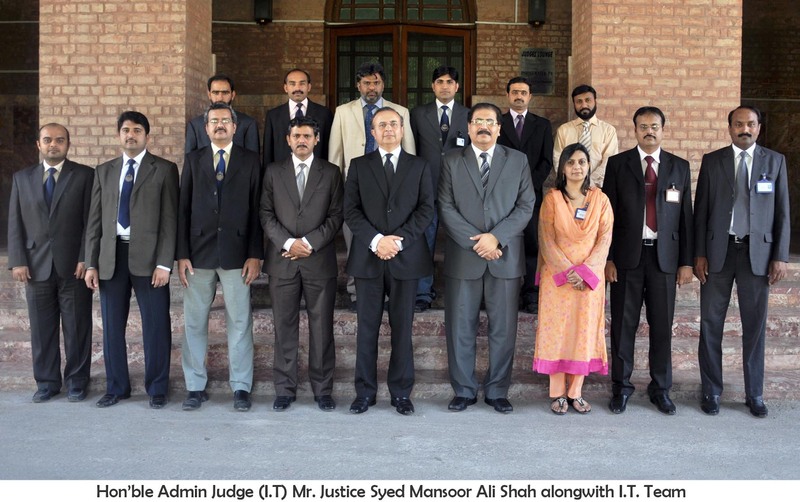 The Hon’ble Chief Justice ® was please to pay great tribute to Hon’ble Mr. Justice Malik Muhammad Qayyum ®, Judge Incharge of the Computer Section for his Lordship’s relentless efforts and noble guidance under which Computer Section of this Court achieved laudable and revolutionary changes in introducing this Court latest computer technology. In addition to information regarding the cases at the Principal Seat now the status of the cases at the Benches would also be available on the web site with upto date data regarding respective date of hearing. The status of the Approved for reporting judgments from the Principal Seat as well as the allied Benches with the names of journals wherein they have been published and the exact citation. Information regarding the status of the judgments (approved for reporting) which were challenged before the apex court of the country. Up-to-date data relating to Green Benches established pursuant to the Bhurban Resolution and cases fixed before them at the Principal Seat as well as the Benches. Now the lawyers community in particular and the masses in general would be able to have upto date knowledge about the news/events with photo gallery of the Lahore High Court, Lahore. Information about the former Hon’ble Chief Justices and the Hon’ble Judges alongwith their snaps. Reports of Judicial Commissions appointed to probe into different incidents would be available. Rejuvenated form of Cause List would be available.